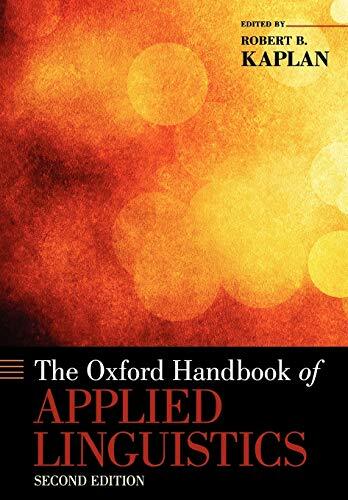 The Oxford Handbook of Applied Linguistics contains 39 original chapters on a broad range of topics in applied linguistics by a diverse group of contributors. Its goal is to provide a comprehensive survey of the current state of the field, the many connections among its various sub-disciplines, and the likely directions of its future development. The Oxford Handbook of Applied Linguistics addresses a broad audience: applied linguists; educators and other scholars working in language acquisition, language learning, language planning, teaching, and testing; and linguists concerned with applications of their work. Systematically encompassing the major areas of applied linguistics-and drawing from a wide range of disciplines such as education, language policy, bi- and multi-lingualism, literacy, language and gender, neurobiology of language, psycholinguistics and cognition, language and computers, discourse analysis, language and concordances, ecology of language, pragmatics, translation, and many other fields, the editors and contributors to The Oxford Handbook of Applied Linguistics provide a panoramic and comprehensive look at this complex and vigorous field. This second edition includes five new chapters, and the remaining chapters have been thoroughly revised and updated to give a clear picture of the current state of applied linguistics. Robert B. Kaplan is Emeritus Professor of Applied Linguistics at the University of Southern California.